NEXT | What's your Blizzard history? Don’t look now, Alliance players — you might have missed a perfectly adorable pet out in Stormsong Valley. Bumbles is one of hundreds of bees happily buzzing around Mildenhall Meadery, but you won’t find him without some serious hunting. There are quests involved in obtaining this honey of a pet, but the initial setup requires you to comb through a variety of mobs. From there, it’s sheer intuition that will lead you onward, with no quest pointing the way. But hey — that’s why we’re here to help you out. Sweet! To gain access to Bumbles, you’ll need to head back to Mildenhall Meadery once you’ve finished the quests out there. Surprise! There’s still plenty of angry mobs buzzing around. You’re looking for the goopier ones out of the bunch. Kill Flowing Honey and Bubbling Mead until you get what appears to bee a random drop — an Annealed Honey Amulet. The only clue of where to go from here is the name etched into the back of the amulet, Rosaline Mildenhall. 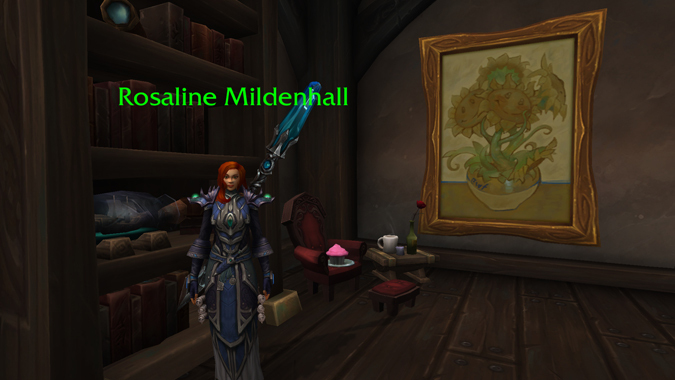 Where on Azeroth is Rosaline? Turns out, she’s out in Boralus…but her spawn is a little random. So far, her spawns seem to be limited to Hook Point, Unity Square, or Mariner’s Row. The best way to find her is to simply make a /tar Rosaline macro and run through those areas, spamming your macro until you’ve uncovered her location. Once you’ve found her, talk to her to return her beloved amulet. But say — why isn’t Rosaline with her husband and son? She’ll actually tell you the story if you take a second to listen. It’s a bit of a bittersweet tale, but Rosaline is just trying to do what’s best for her family. As you may have surmised from questing in Mildenhall Meadery, her husband Raimond isn’t exactly…the most adept with his work. If you listen to all of Rosaline’s tale, she has another task for you. She wrote a letter for little Ancel, and she’d like you to deliver it. Again, there’s no quest involved here, but your task is clear enough. 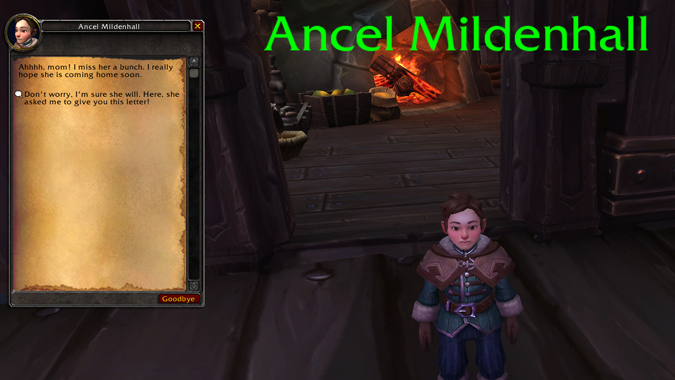 Return to Mildenhall Meadery, and have a chat with Ancel to deliver that nice letter and let the kiddo know how mom is doing. Needless to say, this quest is Alliance-only, as it requires you to chitchat and do quests for Alliance NPCs. I don’t think a member of the Horde, no matter how helpful, would be particularly welcome in Boralus. And now, once you’ve returned to Mildenhall Meadery, the quests suddenly kick in! Ancel has been helping Raimond around the meadery, but one of the hives was unfortunately destroyed — and one of the bees was hurt in the process. Since you were so willing to help out Rosaline and Ancel with little to no prompting, Ancel would greatly appreciate it if you’d help out Bumbles, too! Feeding Bumbles will take some of Raimond’s Secret Ingredient, which you can find on a table in the meadery. Head to Raimond’s lab in the basement when you’re done. There, you’ll find Ancel waiting for you with the soon-to-bee object of your affection, Bumbles! But you can’t just take poor Bumbles now — he’s still hurt, and a little puny besides. You’re going to get a new quest titled Let’s Bee Friends, in which you’ll need to gather eight Vials of Honey Slime from more of that Flowing Honey. This is a repeatable daily quest, so don’t forget to return to Ancel every day and feed little Bumbles. After seven days of feeding that precious little bee, you’ll earn an achievement — also called Let’s Bee Friends — and Bumbles is yours to keep. Like his much, much larger cousin Beehemoth, Bumbles is an all-black bee. While Hunters unfortunately can’t tame Beehemoth — he’s level 122 — you can at least pick up Bumbles as a consolation prize. Bumbles is in the Flying family of pets, and has the standard array of abilities. Swarm of Bees is his somewhat unique ability, shared only with the Seabreeze Bumblebee you can purchase once you’re Revered with Storm’s Wake. But why wait for reputation when you can help out a family and a bee in need? 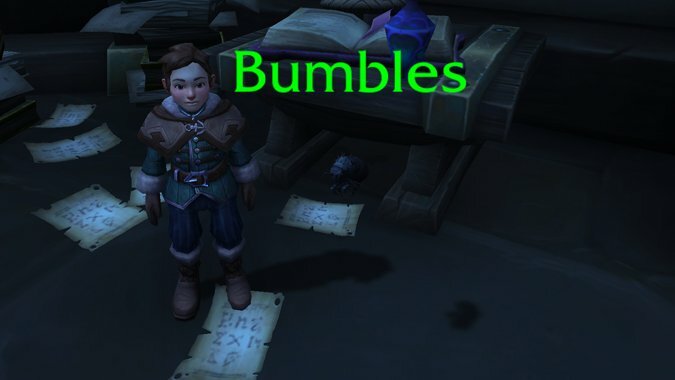 Buzz on over to Stormsong Valley to get Bumbles for yourself.